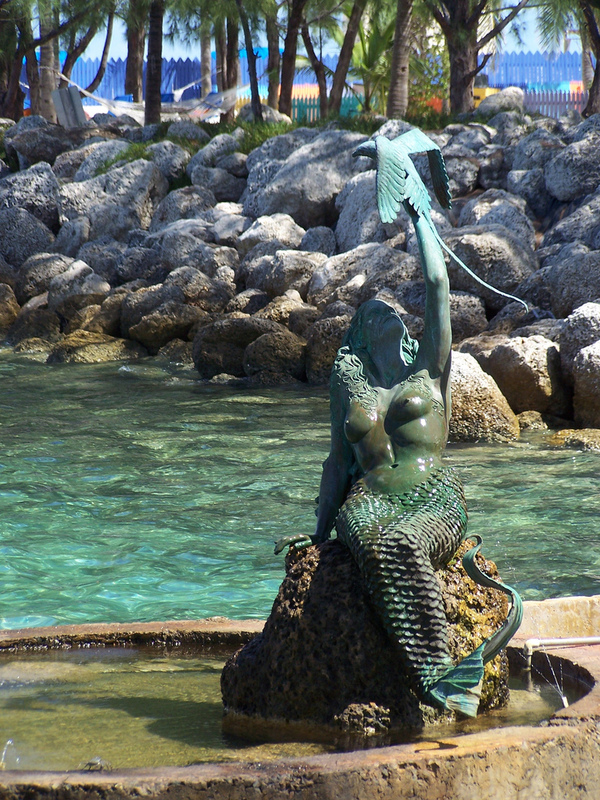 The Mermaid statue on Coco Cay. Photo by Paul Dickerson. 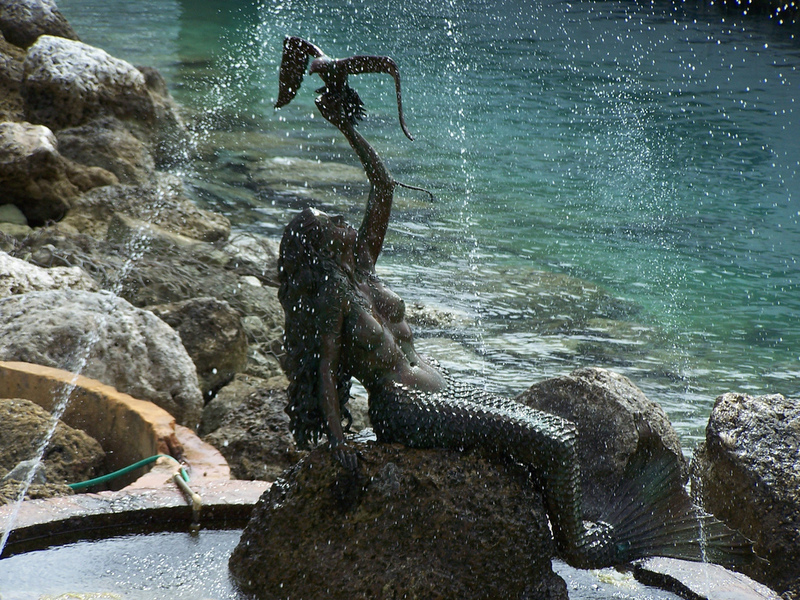 The bird in the mermaid statue’s hand seems to have a very long tail – I haven’t yet determined what kind of bird this is or what the long tail means – if anything. 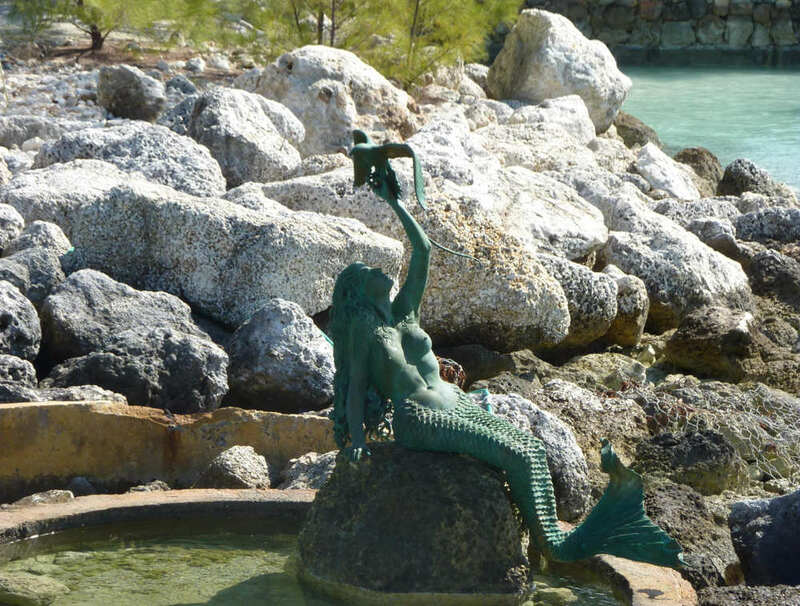 Our man in the Bahamas is on the case, finding out more about this mermaid statue. What we know is that the mermaid’s name is Caylana, she is cast in bronze, is about 9′ tall, and that she has been there since 1992 or earlier, probably from about 1989 or so. It was created by internationally acclaimed bronze sculptor Kathy Spalding (1952-2014), commissioned by Royal Caribbean Cruise Lines. Coco Cay is a tiny island in the Bahamas which is leased by Royal Caribbean for its exclusive use. It has a small dock, so passengers arrive there on small boats from the Cruise liners. While on the island they visit the beaches, restaurants and shops, and the aqua park which was put here in 2003 as a joint venture by Royal Caribbean and the Coca Cola company. Carrying forward the mermaid theme, the aqua park was called Caylana’s Castle Cove, and features inflatable floating castles, water slides and more. Caylana Mermaid statue, with Bird. Photo by Paul Dickerson. The Caylana mermaid statue on Coco Cay. Photo by James Floyd. 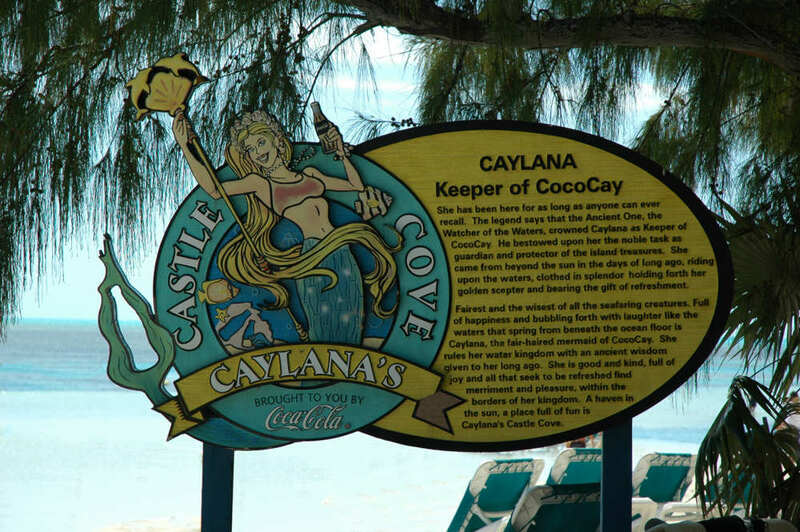 I know of only three mermaid statues in the Caribbean so far – Caylana on Coco Cay, The Little Mermaid replica in Charlotte Amalie on St Thomas, and Amphitrite, located 60′ under water by Georgetown on Grand Cayman Island. More data is needed on this mermaid statue. If you have relevant information on the statue, the bird, the artist, when it was created or placed there, please contact us.